Definition at line 17 of file AclMaxUserIp.h. Definition at line 21 of file AclMaxUserIp.cc. Definition at line 27 of file AclMaxUserIp.cc. Definition at line 151 of file AclMaxUserIp.cc. Definition at line 39 of file AclMaxUserIp.cc. Definition at line 34 of file AclMaxUserIp.h. Referenced by testACLMaxUserIP::testDefaults(), and testACLMaxUserIP::testParseLine(). 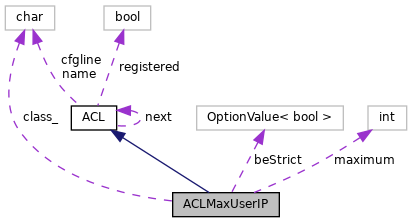 Reimplemented in ACLExternal, ACLIdent, and ACLProxyAuth. Definition at line 286 of file Acl.cc. Definition at line 122 of file AclMaxUserIp.cc. References ACCESS_ALLOWED, ACCESS_AUTH_REQUIRED, ACCESS_DENIED, ACCESS_DUNNO, ACLFilledChecklist::auth_user_request, AuthenticateAcl(), Filled(), ACLChecklist::keepMatching(), ACLChecklist::markFinished(), NULL, and ACLFilledChecklist::src_addr. Definition at line 87 of file AclMaxUserIp.cc. References authenticateAuthUserRequestClearIp(), authenticateAuthUserRequestIPCount(), authenticateAuthUserRequestRemoveIp(), beStrict, DBG_IMPORTANT, debugs, maximum, and Auth::UserRequest::username(). Definition at line 51 of file AclMaxUserIp.cc. References beStrict, and Acl::TypedOption< Recipient >::linkWith(). Definition at line 60 of file AclMaxUserIp.cc. References DBG_IMPORTANT, debugs, maximum, ConfigParser::strtokFile(), and xatoi(). Definition at line 32 of file AclMaxUserIp.h. Definition at line 33 of file AclMaxUserIp.cc. Definition at line 45 of file AclMaxUserIp.cc. Definition at line 40 of file AclMaxUserIp.h. Referenced by match(), options(), testACLMaxUserIP::testDefaults(), and testACLMaxUserIP::testParseLine(). Definition at line 43 of file AclMaxUserIp.h. Definition at line 44 of file AclMaxUserIp.h. Referenced by dump(), getMaximum(), match(), parse(), and valid().